May | 2010 | Dave Andrae's "Blog"
My experiences entitle me to be quite generally suspicious of the so-called “selfless” drives, of all “neighbor love” that is ready to give advice and go into action. It always seems a weakness to me, a particular case of being incapable of resisting stimuli: pity is considered a virtue only among decadents. I reproach those who are full of pity for easily losing a sense of shame, of respect, of sensitivity for distances; before you know it, pity begins to smell of the mob and becomes scarcely distinguishable from bad manners–and sometimes pitying hands can interfere in a downright destructive manner in a great destiny, in the growing solitude of one wounded, in a privileged right to heavy guilt. I don’t have much use for guilt, but everything else feels dead on. 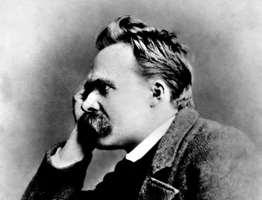 This statement runs the risk of seeming anti-social, and it was probably written while Nietzsche was a bit off his rocker, but it doesn’t strike me as bitter or mean-spirited. One repays a teacher badly if one always remains nothing but a pupil.